I went out on a float today with Jeff from the blog The Fish Whisperer. It was my first river float with my Native Ultimate and I wasn't sure how it was going to handle. We hit the river just as the sun was meeting the water. I still don't feel comfortable scaling any type of rapids. I got stuck on a couple and had to get out to move the kayak. There was really no danger but I found it a little nerve racking trying to get the boat unstuck. Jeff was patient with me even though I'm sure I slowed him down. 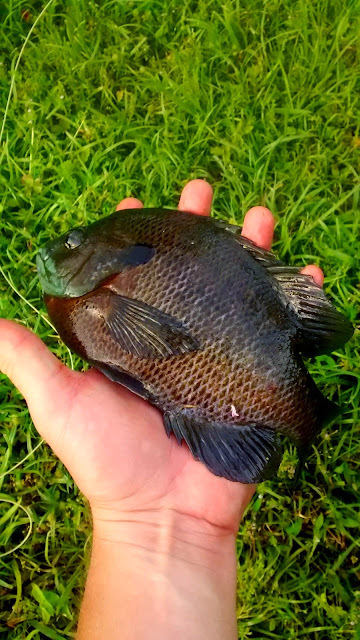 We fished the banks and after catching several sunfish I decided to try a spinner bait. It took awhile but I finally caught a bass. Jeff hooked up often and it really showed that there's more to spin fishing than just throwing it out there. Each bait can be fished with a different technique and it takes skill to be efficient at using everything. I watched Jeff catch fish on what seemed like everything he threw in the water. He was even catching fish right under my boat. While we were talking near some blow downs I heard this splash then saw a monster bass go under my boat. I could tell by it's size right away that the fish was going to be good size. The fish was right at five pounds and a trophy for sure. My day wasn't as fruitful and I kept fighting keeping my boat in the direction I wanted while casting. It seemed like I could only get one good cast and the yak would be out of position. I still enjoyed the day and took in the scenery. I'm on the fence on whether on not I like fishing from a kayak. It's alot more difficult than I thought it would be. I'll give it a few more tries before a make a decision. Life has been lackadaisical lately. I've fished a few times but the catching wasn't good. Thank goodness for gills. I snuck out today and hit my favorite gill spot.